SJ. What is your background and what are the main requirements and motivations of your job? TS. I trained as a Chartered Accountant with a small firm and then KPMG before moving to rail. My remit is what we would know as white coach, The Kings Ferry, Eurolines and National Express Germany (Coach). I think that transport is something which is important to all of us and the linkages you see between real life and modelling or theory is what makes it really challenging and interesting. Whilst we are all individuals, there are patterns and predictability in people’s behaviour and there are things that drive transport use, modal share and the other pieces. There are some pretty well established relationships so that as you improve service quality, service frequency, time, cost and price you can shift that and grow. One of the things I find challenging and enjoyable about all this is how you combine those things to try and turn a mature business into something that is growing. How do we look for new routes, how do we speed up or improve what we’ve got to get growth. It is something we’ve been pretty successful at over the last year or so and look to continue. We’ve seen something like 9% passenger growth in the last year, which is really encouraging and I think we’ve done a lot to drive that. I’m quite pleased with that. With my background I think what I have brought to it is, I was going to say a logical approach, which makes it all sound mathematical but some of those disciplines of how you fit those bits together. If we know what customers want, and we really know based on a bit of research rather than just anecdotally think we know, we can deliver that. You know it’s going to have a result. Sometimes it’s easy for things to become clouded by gut feel, although gut feel can be important, or one’s own personal ideas, so how do we bring it back to something that we know is going to work. We’ve got something that says actually, faster journeys work, cheaper works or actually the trade off between fast and slow and how that works that can benefit us. We’ve got examples where we have sped some journeys up and we’ve slowed some down and we’ve adjusted the pricing and both have grown because we know how that dynamic works. And that’s really quite exciting. SJ. How many routes and how many contractors do you have on the network? TS. We run approximately 1,600 services a day to about 1,000 destinations. We track them in detail measuring our performance at every stop. Across our network we deliver something in the region of 85% on time (0-10minutes) performance. On airport services it is higher. Probably 90% are in that window and within half an hour or an hour it is very, very rare that you are not there. A lot of people, especially non coach considerers, find it surprising how punctual we are when the roads can be terrible. We’ve got a lot of experience of managing it. People think your performance must be worse than rail because rail is dedicated. It is, but you can’t divert. Fundamentally that’s our advantage; that we can. If the M4 has congestion you’ll be slower but we’ll get you there. We’ll use the A4. I think when you look at the recent weather disruption, we’ve lost very few services, a tiny number have been a complete failure because of weather conditions which is a flexibility that coach brings. Currently we’ve got about 35 contractor partners and three principal owned operations at Sipson Road (Heathrow), Luton and Start Hill, Stansted. My view is that one of the advantages of our model is being able to work with these very passionate, very professional smaller and medium sized companies that it is inherently personal for. It brings us a very personal touch. We are a national company with this strong local or regional identity. The operators, while they are all branded as National Express, have knowledge and it’s that knowledge which is important to me. We get feedback from the operators saying: “look guys, you’ll want to change the times here because you’re just missing this” or “the stop is in the wrong place”. Over the last year that is something I’ve looked to really, really encourage. 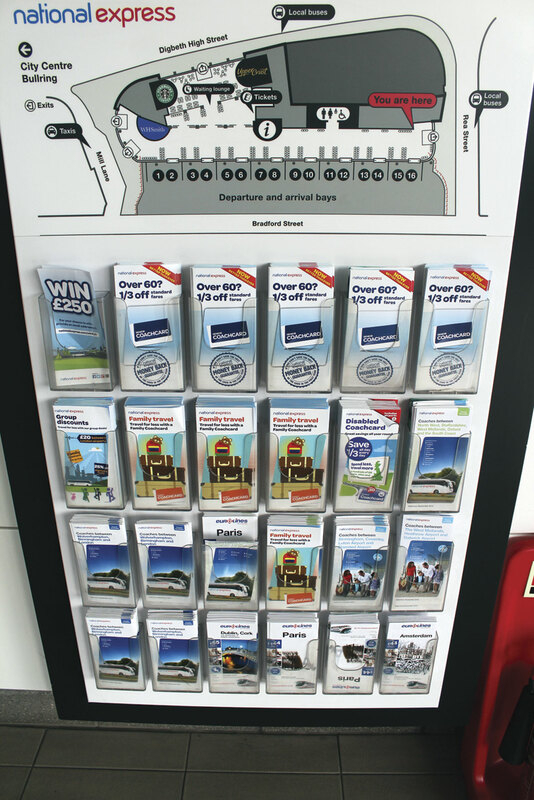 How we communicate and how we link with our local operators. They are all running successful businesses, they all care. They are a great source of knowledge. We are trying to run a national network and there’s only so much we can know, and yet we’ve got this huge resource of people. That seems to have paid dividends and we’ve seen great engagement from the operators. They know that if those routes are successful, they are going to grow. It’s not rocket science. If those coaches are full there’ll be another one coming along and they’ll be the operator. It is self fulfilling in some ways. SJ. Why do you have this mixed own fleet/contractor model? TS. I guess we’ve found it works for us to have it. There’s a bit of benchmarking. It does give us a flexibility to move to respond to the market in terms of routes, better than us being fixed. It does give us a chance to use very good local regional businesses and as a group it works for our capital structure that those assets are owned and funded by a third party which is obviously good for the company. We have other heavier capital businesses. In terms of that it is a structure that works. The balance isn’t set in stone particularly, it flexes. The other thing is that having our own locations is great for us because it gives us that understanding. It gives us flexibility as well, particularly for ad hoc events. We are looking to develop how we inter-work what we do with what operators do. Some of the traditional models of where a route is only run by one operator may be more efficient run differently. On a route running in and out of London it is probably easier for us to do it rather than another operator. We might say, you do the country end start, we’ll do the London end start. How do we inter-work that? There are benefits for everybody. Having our own operations gives us that flexibility and knowledge. I think benchmarking is important as well. It allows us to benchmark what our cost of delivery is and what theirs is, but also to learn from each other. Everybody can always learn. We have stuff to learn from operators, they probably have stuff to learn from us, but it’s not a one way thing. We don’t sit here thinking that we’ve got all the answers. The guys are running very professional, very profitable fleets, some of them are running their fleets tighter than I run mine. So you can imagine the challenge I’ve been given. SJ. What has been the main objective over the past few years and how far have you got in achieving it? TS. I joined just over a year ago. My objective was very much to re-establish growth in a safe reliable business. I’m hoping that is something we’re starting to achieve. As a business we suffered really badly from the CSOG reductions. It pretty much fell straight to the bottom line despite efforts to mitigate it. It’s been important to put the business back into growth mode, which we’ve done, growing both passengers and profit. There’s growing the top line, which we’ve done, but there is also a need to continually look at our cost base and our efficiency. You have to keep that constantly under review. There’s always the risk that as you get a bit of top line growth you take your eye off the ball, and that’s just pain because you go through cycles then of having to trim it back every so often. One of the things I learned in rail which we’re challenging ourselves on is the disciplines around operational efficiency and operational excellence. We are a transport business and that has to be to a certain amount about the detail. Going back to frequencies and journey times, it is how that timetable works and is resourced. By thinking about the detail of how we plan our service, how we allocate routes to operators, we can deliver more at a better cost. Last year we rationalised routes out of Norwich and Cambridge. We improved the service yet we took mileage out. We’re now growing revenue from the area with a cost reduction of about £1.5million, and we added connectivity. Norwich to Cambridge wasn’t served previously as a direct flow, it now is, yet we took out a load of mileage. The revenue is up, passenger numbers are up, and it was all down to the detail of looking at how do we do things better. Part of what I have in my mind as a challenge is how we rationally do this across what we are doing, not just from a cost efficiency piece but from the journey time piece and the punctuality piece. Our timetable is probably something that has grown up over 40 years. The existence of some routes goes back into the depths of time. Are routes running at the right time, are they in the right places, is their stopping pattern right? Let’s have a look at them. We have a timetable process which is looking at how we improve every route on the network and which places should be served that aren’t. When I look at certain journey options I find things that I think should exist but don’t. The network is something that grows and enhances. Last year we introduced five or six fast London services each way from Bath because we know that fast is important, and they’ve grown really well. We’ve kept the connectivity on the other services, so Chippenham, Swindon and Reading are still there with some fast ones overlaid. It’s a day trip market, so you can get there in the morning out of London and also go into London so it works nicely. It is something that is alive and growing as customer demand changes, which is hugely important. We think that putting time, effort and resource into understanding what the customer wants, where the customers are, which universities are growing and which ones aren’t, where people are now going to and from is massive. 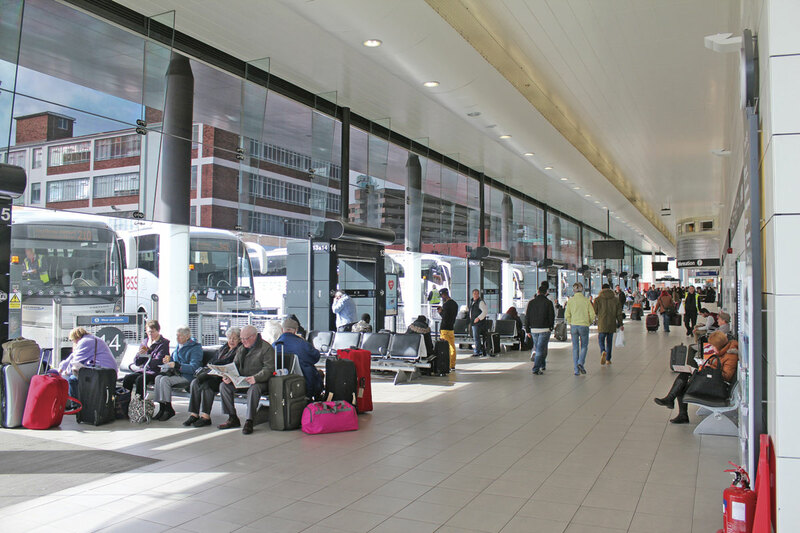 It’s like investing in the airports; investing in our route network, not only in the direct A1 more shuttle type services in and out of London, but, for instance, how does Heathrow get served? Fundamentally, are we arriving at the right times at the right terminals from the right places. It’s all stuff which is, at one level, entirely obvious but takes an awful lot of time, effort and knowledge, as well as cooperation and collaboration with other partners including the airports and airlines, to get right. It comes back to establishing growth. For me, the basic pillars of transport are: is it going to the right places at the right times, at the right speed and at the right price? It’s not rocket science but it’s a big network that’s been here a long time. Within that, it’s the connectivity of the network that is really important. The places we serve is one of the uniquenesses of what we have. The ability to get from smaller towns into somewhere and on to somewhere; that is a unique thing. SJ. What is the aim of the Wembley sponsorship deal and is it delivering for you? TS. Wembley is an iconic venue with lots of good events and is a good fit for us. We run a pretty comprehensive network in and out of Wembley. It’s about doing things that people want to do. We’ve done quite a lot of research and we facilitate a lot of good things. Our travel is around people going on holiday, its visiting friends and family. It’s doing the trips that you want to make and Wembley is one of them. It’s like going to festivals. We run a huge number of services in and out of the festivals over the year. Glastonbury is a massive event. As National Express we ran something like 15,000 people in to Glastonbury last year. If we combine it with our Kings Ferry operation, who provide the transport support for SeeTickets who are the integrated retailer, we moved something in the order of 32,000 people. It is a massive proportion of that festival. There are certain challenges and last year wasn’t so bad because it was dry. I spent departure day down with the team helping to load luggage and what have you and it is brilliant. The attitude of everybody, the festival goers, our customers, our partner operators and our own ops turning out the vehicles were superb. As a festival they’ve got a big commitment to public transport. 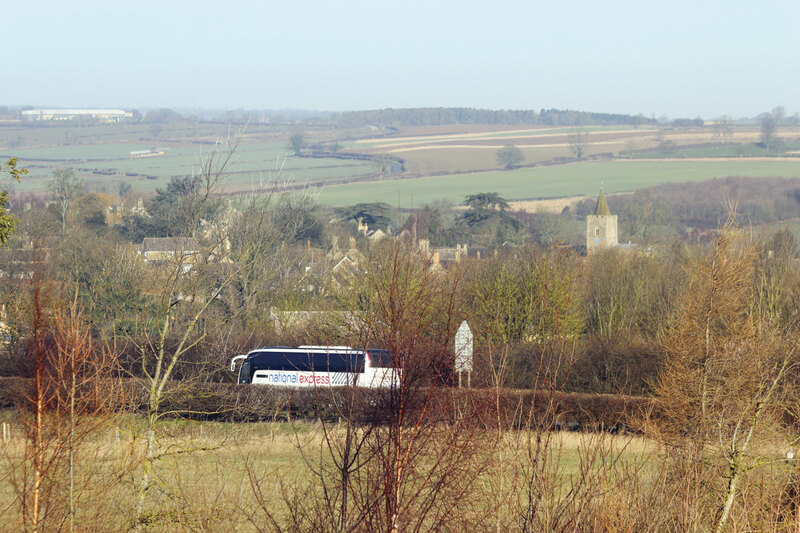 Given the allocation they need to have, coach is a phenomenal option, far better than rail, because you are getting to where you are going, not to Castle Cary an hour away. The other interesting thing for us with both festivals and Wembley is that it’s not necessarily our traditional considerers. Maybe Wembley even moreso; we’re doing something there with people who may not normally consider using the coach. So it’s a good sales platform for us as a business. We try and make sure that the experience is good when you are going to Wembley and increasingly we are using network vehicles, so they know that this is what you get. Inevitably it will always present us with problems, especially in summer season when we have more duplication, but we’re looking at how we can use more network vehicles to keep that customer experience good and representative of what we deliver day in and day out. I always find it really interesting when you get people who don’t use coach, or don’t use National Express, on to a coach, I’m always surprised when they ask, “is this a first class vehicle?” “No, this is what you get.” We have on board power, air conditioning and we’re looking to put entertainment and wi-fi and other customer enhancements on. That’s something I think you need to keep constantly under revue as to what services you are offering, just to continually make that customer experience better. We worked really closely with Caetano to keep making that customer experience better. It’s a constant challenge about selling what coach is. When we get new customers on board we get quite a high retention. When things happen that push people to us or try us again they do stick and that’s really encouraging. With what’s gone on in the South West with the sea wall at Dawlish and Torbay being cut off from the rail network, we’ve just increased our service offering. We’re running five extra services a day and some non-stop Plymouth London express services. It’s Plymouth to Hammersmith non-stop in four hours. Actually, the fastest previous rail time was probably about three hours 15 minutes, so the differential is not very much. I was chatting to Kevin Gale, my service delivery Manager who was down with the operator last week and he was saying that the drivers were saying that the predominant comment is, ‘This is costing me £27 and last week I paid £130 and I’m getting there in roughly the same time. And without being disrespectful to my former colleagues, they aren’t always the most reliable journey times on that line. And now with train-bus-train, it’s not a very great experience. 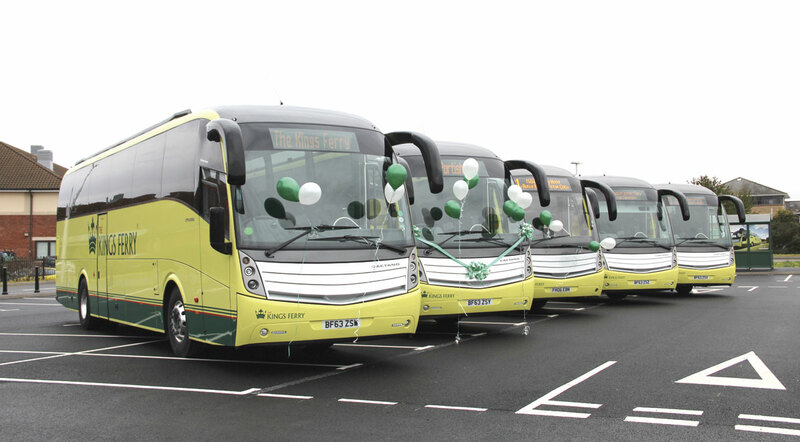 Since Dawlish, demand for our services on our Plymouth route has doubled. 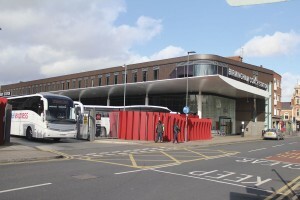 It underlines the flexibility of the coach network. You can step in. You can bring in new services at the drop of a hat. I think what comes out of it again is that for people who haven’t used coach for a while or their experience has been of a holiday coach or an emergency coach, it is very different to a modern Caetano Levante or a Plaxton Elite. It’s very different and they do come back, which is very encouraging for us and across the industry. I think we all want to see the market for coaching expand. SJ. Is the nature of the airport market changing and if so how are you adapting to it? TS. It’s a key market. 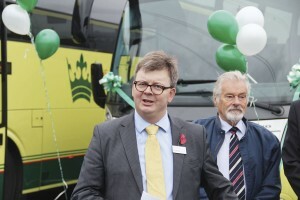 In the last year we did the A1 route and the Luton route. We are continually looking at our airport routes. 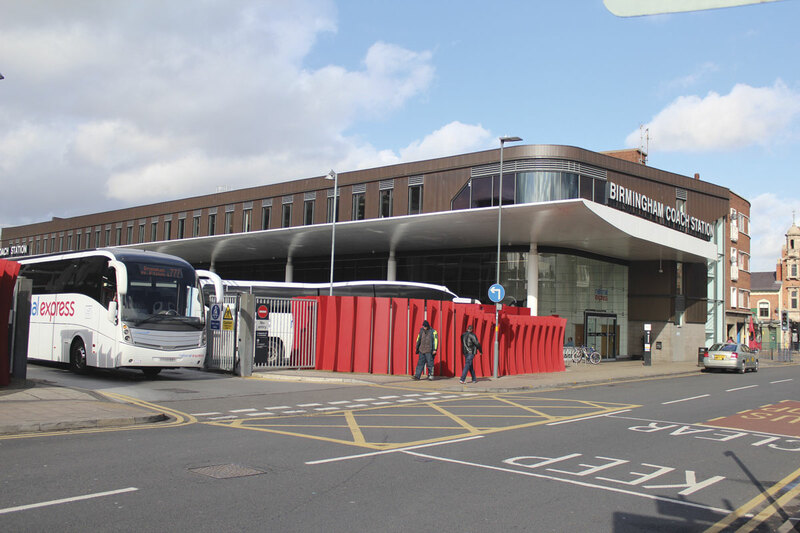 We have a mixture of the A routes which are dedicated almost shuttle routes but we serve lots of airports, principally Heathrow and Gatwick, on non-A routes. The country into Heathrow is really important. The connectivity we provide from Birmingham and the regions into Heathrow for specific needs is really important. And the same for Gatwick. Fundamentally, all of the airports want to work with us. It is changing. It’s growing and our network is adapting to it, flexing to meet the demand. We have the ability to increase capacity, which we’ve done. We provide more quicker services now, principally from Bristol, Cardiff and the Swansea area. We’ve changed our route network into Stansted. It changes with the airport’s needs. Us understanding how the airports are growing and where they are serving allows us to change our network accordingly. It isn’t just the big London airports we work with, it’s all of the main regional airports around the country. We look to understand new airlines coming in. We’ve talked with Birmingham about what their plans are. Which new airlines might be coming in and where they think those customers might want to go or where their catchment area is? All airports are constantly changing their mix and how their terminals are used, which airlines fly where: it’s part of the evolution of what we do. We work with all of the principal airports to try and understand how we can support them because they all have surface access strategies. How does coach fit with that. Again, I hate to come back to it, it’s about the detail of knowing that there’s a flight there at that time, going to that destination and its principal users come from that catchment area. We can deal with that. No other mode of transport can deal with that apart from the private car. It’s that tailoring. We can’t always do it fast, but it’s the way we think. How we flex and how we develop to serve our markets. I suppose the other change is our partnerships. We look to work closely with the airports but also with the airlines, understanding what they need from a partner. Whether it’s with Ryan Air to provide a high frequency service out of Stansted together with through ticketing, just like we do with Wizz Air out of Luton, or on board the plane as we do with Easyjet, we’ll expand that more and more. We have conversations with all the airlines about how we can provide them with an enhancement to their proposition. The ability of an airline to offer a seamless way for travellers to get to somewhere is something we are interested in and working towards. SJ. What are the biggest challenges National Express faces? TS. We’ve talked about developing the network. Conceptually, our biggest challenge is keeping abreast of what our customers want and how their desires and needs are changing. We have a research programme which looks to do that. It’s trying to be something for the whole country and that’s big geography to cover. We have the people and resources to deal with it. Keeping abreast of technology in terms of ticketing and customers expectations of integration is something which I think will always be a challenge. It’s something that isn’t always within our gift. I was talking to someone the other day and they asked, ‘Why don’t you display dynamic information on every bus stop. That would be very nice, but they’re different systems in every town and how do I integrate with that is a technological thing which is very challenging. 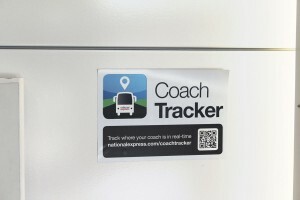 We have an approach that is CoachTracker, our own system that allows you to download it to your phone or your computer or your tablet. That technology piece is always something that is going to be there. We invest heavily in it and will continue to do so. It’s trying to keep up with that customer expectation. In places we’ve got some way to go but it’s one which we’re very focused on. That expectation of what travel is for and what it’s about. Punctuality. It’s what it’s about. Roads are busier. How do we respond to that? How do we manage our network? How do we communicate with our drivers? It’s all evolving constantly. We have a very good relationship with the Highways Agency and we’re strengthening that the whole time so that we understand what their ‘planned’ disruption is but also, when things start to happen, what they’re doing and how we can mitigate the impact on ourselves. That’s a constantly changing piece. SJ. You have started the new north Somerset commuter operation under the Kings Ferry brand. Will we see the brand used elsewhere and if so what are your ambitions for it? TS. I think our Kings Ferry brand is a very strong brand, particularly around the commuter operations. We’re keen to roll it out to new markets. Commuter is interesting, it has a slightly slower build up, as people change their patterns. We’ve got three or four potential locations that we’re investigating at the moment within a 12 to 18 month timescale. We are looking at a number of places and talking to a number of parties about how that will work. We saw record numbers of passengers on our Kent to London commuter services last year. We’re seeing half a million passenger journeys a year so it’s doing very well indeed. It’s back to the point that it’s good value and it’s reliable and punctual. SJ. What will future vehicle policy be? TS. Our specification is now Caetano Levante on Scania, Volvo or Mercedes-Benz chassis. Going forward it will be exclusively the Levante. We went through a process and that’s where we ended up. This year we’re ordering 28 tri-axles for Stansted plus another 14 tri-axles and we’ve got another 20 to go this year. It is all part of making sure that the fleet stays at the We’re looking at an average age of between two and three years. Our theoretical maximum is seven but they’re pretty high mileage by the time they get to seven. The Stansted vehicles we’re retiring this year pushing that limit at over six years and they’ve done a couple of million miles each. We look to keep them younger than that across the network so in a sense it is probably about the oldest fleet that is out there. A lot of our operators recognise that high mileage and that they’ve got to have their own programmes within their own businesses as to how they bring in new vehicles. Whilst we have a maximum age there are quite a few operators who won’t let their vehicles running scheduled work get to that, they’ll drop them into private hire and other things to manage the mileage. It makes huge sense for everybody. SJ. Overall, what has been your experience of running three axle coaches and do you see a long term future for 15m coaches? TS. We have got long vehicles. It’s all about the right place at the right time. We have a specification for our core network vehicles around the Levante. There are tri-axle Levantes, there are twins, there could be other variants. There are 15m Elites too. The key bit is that we use what is right for the market. SJ. Have you any plans to introduce sleeper coach services? TS. We’ll keep it under review. It’s not high on my priority list. SJ. 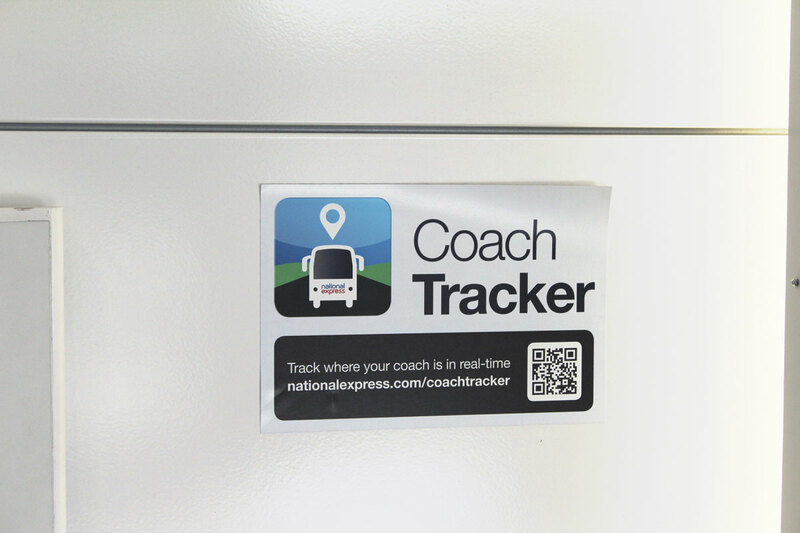 Is there a future for double deck coaches within National Express? TS. There’s not a definitive either way. It’s something we’ll keep under review. If there was the right location, the right demand, then it would be in consideration. It’s not something that has a line through it. Kings Ferry runs double deck coaches. It’s slightly more complex and clearly there’s a history there but it’s not a blanket ban. We’ll use what’s right for the market. SJ. How is the senior citizen market holding up since the withdrawal of concessionary support and what measures were taken to achieve this? TS. 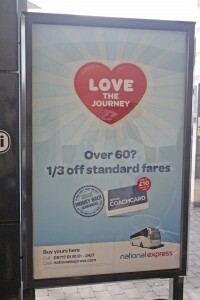 We have our Senior Citizen’s Coachcard which gives you a range of benefits including a third off. It costs £10 and we guarantee that you’ll save or you can have your money back. There’s a pledge that if over the course of the year you don’t make your tenner back we’ll refund it. There are extra rewards with it in terms of a programme where you can get discounts off hotel breaks etc, etc. We have that in place. We also have a trial scheme in Southampton, the first of its kind. If you are a concessionary card holder, using the Coachcard gives you 10% off the buses. We’ve linked with Southampton City Council so that senior citizens in that area can access the coach network and get a discount. That’s been successful. We are seeing an improving trend in the seniors market with positive year on year growth. So the senior market is good. It dropped and has re-established itself off that new base. It’s slightly more opaque because previously it was absolutely clear who was a senior because they were part of a concessionary scheme. There’s less of a motivation to tell us unless they are on one of our own cards. The benefits are still there; seniors still recognise the convenience, the way our drivers will look after you, the fact that if something does go wrong you get looked after, help with your luggage, it’s the same. SJ. Apart from it being a legal requirement, is the provision of wheelchair accessibility financially justified? TS. Yes. I absolutely believe that having an accessible network is the right thing to do. We’re committed to it and making it better, just as we are committed to the Military Covenant. We were one of the first companies to sign up. It’s about providing opportunities for service men and women in the forces. As an organisation we have a responsibility to engage and lead in these things. We are looking at what we can do for young people. These are themes that are important to us and to the UK as a whole. Organisations do need to stand up and be counted. National Express here and across the group are very committed to it. We have our Youth Foundation and we at coach are looking at how we do more to support young people’s mobility, not just in getting from A to B but their social mobility, educational opportunity and employment opportunity. What can we do in a small way to make things better. I passionately believe that’s the right thing for us to be doing, which is why we support things like the skills show which was a great event last year. We did road shows around the country, had a vehicle touring around showcasing what kind of jobs are on offer, we were at the show. It’s a great thing to be doing because we all need the next generation to engage with employers and get the right skills. There’s no point in sitting back. You’ve got to be part of that to drive it forward. SJ. Are there any other points you would like to make? TS. 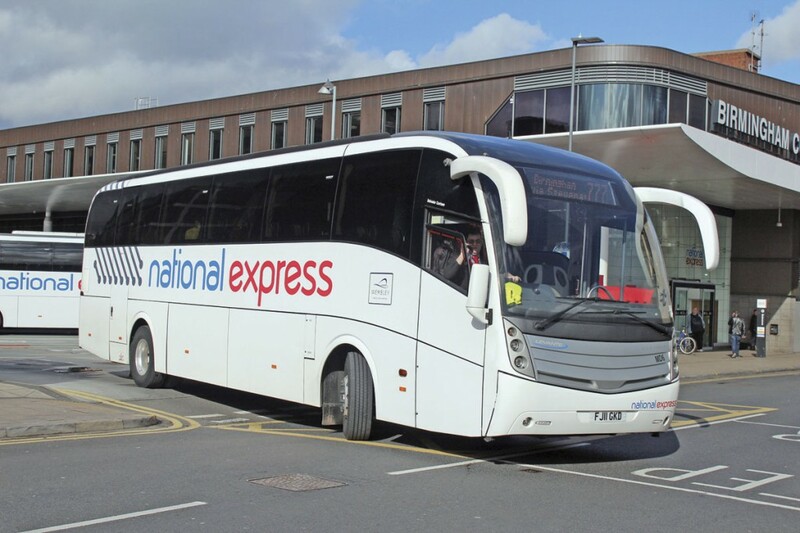 I just think it’s a hugely exciting time for National Express as a business to grow and develop. The demand for transport is there. People want mobility and we are in a great position to provide it. We have a great team of passionate people, we have great operators and a model that really works. It’s exciting I look forward to many years of growth and expansion. SJ. Tom Stables, thank you very much. There is no way a coach restricted to 62 mph can do Plymouth to Hammersmith in 4 hours. The fastest train service takes 3 hours with two intermediate stops and spends a large proportion of its journey at over 90 mph. You can believe me i am a megabus driver.Bristol to London 2and half hours.